It's that time again for our weekly review, but being that we were absent for last weekend, I will include the last two weeks. My particular favorite was this Friday's revelation that Palin really doesn't read, which was evident in her inability to name the title of the current book she was supposedly reading, or even get the author's name right! Jumping on board the anti-WikiLeaks bandwagon, Sarah Palin tweeted and Facebooked about how Julian Assange was such a bad man, so much so that she wanted Assange, an Australian, charged with treason. She also wondered why American military defensive allies were not involving themselves in the WikiLeaks matter. In addition to misunderstanding the act of treason and the purpose of America's military alliances, Palin also wanted to freeze the funds of WikiLeaks. Considering the combination of all her comments, it would appear that Palin would want to deprive Assange of due process - presumably after she charges the Australian with treason against America, she would claim he does not get any constitutional protections because he is not American. I found Palin's comments regarding funds very interesting considering the opinion held by right-wing types that the government had no right siezing piracy and counterfeiting websites because doing so violated those webmaster's due process. Republicans hold up unemployed benefits demanding Democrats work with them on other issues first before they consider Democratic proposals, like the extension of unemployment benefits. Earlier in the week, Republicans made a pledge to block all legislation until Congress resolved how to fund the government and how to extend all the Bush tax cuts. Democrats would be fools to believe they could work with Republicans on this matter being that Republicans are the reason why unemployment benefits have lapsed - what makes Democrats believe they could trust Republicans to compromise on unemployment benefits now when they haven't on any legislation for the past two years? According to a blog post by fellow Dancing With The Stars Contestant Margaret Cho, Bristol Palin was forced to dance by her former half-term governor mother because her momma blamed Bristol for losing the election for her in 2008 - the one where Bristol played the pregnant single teen mom. Bristol of course responded by claiming Cho was wrong and that she did the show on her own and with her mother's support, as if mama Palin didn't tell her to say that - Palin's own handlers probably penned the response being that it appeared on Facebook (just like big Palin). Just as you thought Republicans couldn't get even more special interest, Newt Gingrich pushed the envelope further by insisting millionaires should determine their tax rate and for how long, while millions of Americans are unemployed. "What Republicans ought to do is say to people who create jobs, how many years does the tax code need to be extended for you to make an investment decision?" said Gingrich. "I mean, the goal’s not to have an annual extension of the current tax code, and then have every business in the country trapped saying, 'I don’t know. 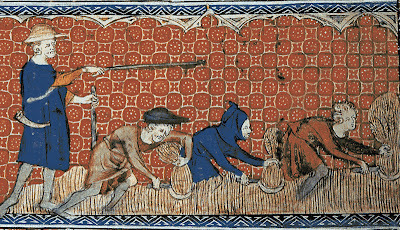 I want to make a 20 year investment in a factory.' … There is a number, but I would have the business leadership of the country describe the number." Sadly, Obama caved to stubborn Republicans yet again. He had the opportunity to paint the GOP in a negative light by blocking tax cuts for the middle class giving him some political leverage going into the second half of his term but he decided to opt for compromise. I understand that is what he campaigned with but when the GOP decided to oppose all things Democratic, I think Obama and his party should have abandoned compromise and gone it alone. While I like aspects of this tax deal, I would have rather the tax cuts expire so that America could get its finances in order. The old cook from Arizona, John McCain, made an interesting statement. In one of his many hypocritical statements regarding the military's "Don't Ask Don't Tell Policy," McCain decided to attack the report he once called for by claiming the Pentagon's survey was not representative of the entire military force and should be therefore disregarded. I thought this was interesting when taking into consideration John McCain's electoral numbers in this past election. McCain claimed that the report only represented 28 percent of the military and that "troubled" him, but take a gander at voter turnout numbers in Arizona - McCain won the GOP primary with around 57 percent of the vote, with turnout at 28.2 percent. That means McCain won the primary with 16 percent of the Republican vote. In the general election, McCain won with 59.3 percent of the vote. With 68.9 percent voter registration and voter turnout at 59.8 percent, McCain won the general election with less then 25 percent of the vote of the entire electorate. McCain is old enough to use an abacus and notice the math he uses to try and derail DADT also proves he is not representative of his state or their opinions - only a minority of people who voted. While I disagree with Ron Paul on many issues, I found the Texas representative to make numerous excellent points in this speech he made on the House floor. MY only complaint is that he should have steered clear of any reference to American empire building - typically that kind of rhetoric is dismissed as crazy, with the entire speech running the risk of being discounted. Media Matters for America revealed a pretty damning email from Fox News Washington managing editor Bill Summers, encouraging journalists on the cable channel to rephrase things like the "public option" using more conservative-friendly terminology. Keep in mind that Summers instructed the journalists to do so, not just the "opinion" staff like Bill O'Reilly, Glenn Beck, and Sean Hannity, meaning Summers and Fox News sought to manipulate the news and sway public opinion - all this from a channel that claims to be "fair and balanced." It makes you wonder just how many times they have sent out emails like this in the past. In perhaps my favorite post of the past couple weeks, Barbara Walters released the rest of her Sarah Palin interview, in which a visibly irate Palin rambled on about how she was a victim of mischaracterization by the mainstream media, using various sexist terms to describe her "anonymous" critics. It is interesting that she used masculine pejoratives to describe her critics yet she claimed they were anonymous - perhaps she does know their identity. A commenter left an interesting remark on the post recalling the hot water Barack Obama had gotten in with conservative pundits when he used the phrase "lipstick on a pig" - Palin and the right-wing claimed sexism, yet what would she call her use of the words "impotent" and "limp," and claiming her critics are "hiding behind somebody's skirts?" It would be the same as someone attacking a female critic by insisting their comments are overcompensation for them being "barren" and that they are just trying to "wear the pants." Probably the most interesting part of the interview came when Palin decided to open up about her preferred reading material. 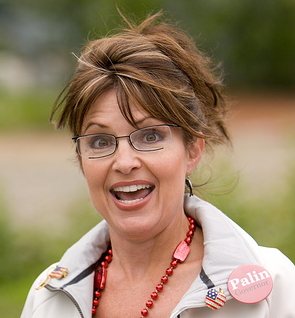 While Palin rattled off some typical conservative-slanted publications like Newsmax, newspapers like her employer-owned The Wall Street Journal, or such divine readings as C.S. Lewis novels like "The Lion, The Witch, and The Wardrobe," Palin's most favoritest book in the whole wide world at this point in time is a book by an ultra-marathon runner. 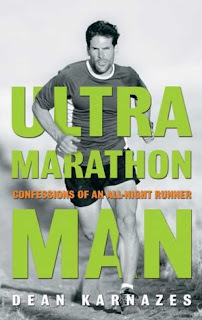 Palin stated in the interview that she is reading a book by Dean Karzo about running but the problem is that there is no book by a Dean Karzo. Palin screws up the author's name, which is Dean Karnazes. Maybe she was thinking of his nickname, "Karno," and combined it with his real name, but considering his name lacks a hard "z" sound, I think Palin never read the book. 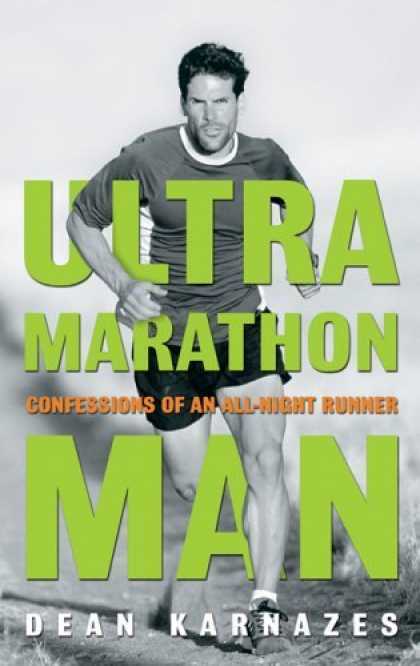 Basically, everything she told Barbara Walters about her really good read is in the title of the book: "Ultramarathon Man: Confessions of an All-Night Runner." Too bad the title is bigger then the author's name, otherwise Palin may have actually gotten a question right in an interview for once. Although technically part of next week's Pick Of The Week, I penned this post prior to writing this one - Sunday is sort of a gray area. In order to make her self look more important, Sarah Palin jetted over to impoverished Haiti to survey the cholera outbreak with intolerant preacher Franklin Graham. Surprisingly, Graham expelled all Haitian and American press except Fox News, who dutifully followed Palin around for some photo ops with some foreign workers and maybe a sick child or two. 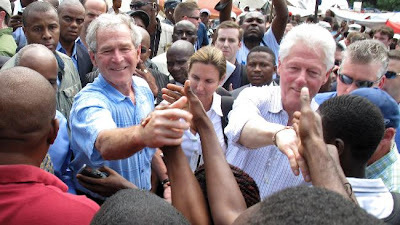 Palin didn't really get down and dirty like former presidents Bill Clinton and George W. Bush - I give Bush credit even though he did wipe his hand on Clinton after shaking the hands of some Haitians because at least he got into the crowds. For the most part, Palin avoided crowds, or really anyone, and retained control over the media surrounding her.